Kerbal Space Program is rapidly becoming a more expansive and complex rocket simulator and that’s helped alpong greatly by Kerbal mods. 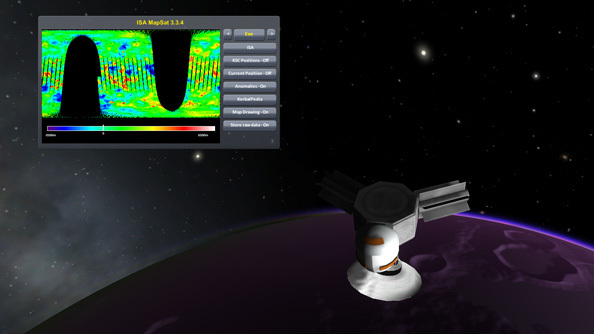 With the launch of Kerbal Space Program 1.1 the game has leapt forward, but as well as Squad’s own stellar work, there’s also an enthusiastic community of modders constantly pumping out their own brand of features and enhancements. New clouds, better physics, catalogues of new rocket parts. You name it, and within reason, it probably exists somewhere in the Kerbal SpacePort add-on repository. But without a guiding hand it’s difficult to know where to begin. So I offer you mine. My guiding hand, that is. Take it, hold tight, and let’s fly, like a cosmic Peter Pan, through the magical world of Kerbal Space Program mods. Kerbal’s default atmospheres are fairly boring things, a flat layer of cloud cover that helpfully vanishes as you rise through it before turning back into a low-res coating of mottled grey from space. Better Atmospheres does exactly what it says on the meticulously detailed tin, adding more detailed cloud cover not only to Kerbin, but to any other planet lucky enough to have a shred of gas enveloping it. Most planets are visible from Earth without a telescope, appearing as starlike dots in the sky. In fact, the word ‘planet’ comes from the Greek word for ‘what the heck, that star is moving around’. The Distant Object Enhancement mod draws this aspect of reality into Kerbal, rendering distant planets and moons as tiny dots with their flares intact. Other objects such as ships and anything else you fling into space will also be visible from a greater distance, which might not seem like a big deal, but really enhances the spectacle of the early stages of docking with satellites. 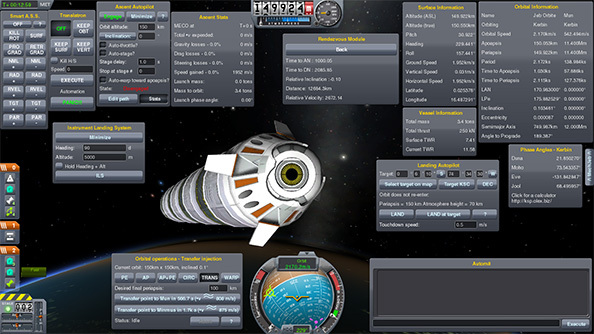 Arriving before Kerbal Space Program received its recent expansive First Contract update, KSP Interstellar introduced a giant tech tree of new engines and fuels and other custom parts, which you’d unlock by exploring the solar system and setting up permanent bases in orbit around and on the surfaces of other planets. The technology you discover is all roughly rooted in real world science, with things like anti-matter engines available to players who can progress far enough. In the real world, or off of it, one of the trickier aspects of space travel is descending from a nice cold orbit back into the atmosphere without exploding. Hitting the sky at around 15,000mph tends to make air get rather hot, so considerations must be made for the angles and velocities at which you sluice into the big blue. 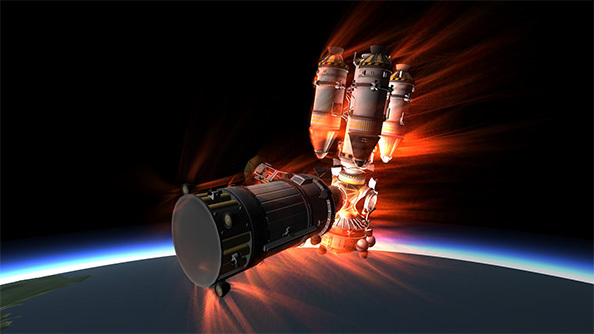 Deadly Reentry is another well-titled mod, introducing to Kerbal Space Program this concept of careful returns to terra firma. Improperly shielded or over-exposed parts will be destroyed by the intense heat of a sheer reentry, while planets with heavier atmospheres become even more challenging to touch down on. 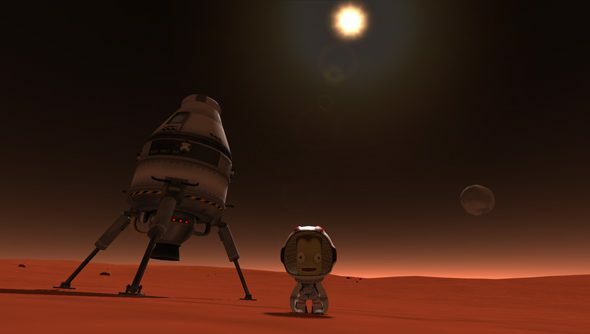 Named after the space program’s pioneering kerbonaut, Jebediah Kerman, Mechanical Jeb is an auto-pilot system capable of managing almost all of the most common space maneuvers. Assuming you bolt the MechJeb panel on to an appropriate craft (it’s a physical attachment), it can lift off into orbit, circularise that orbit, transit to and from moons and planets with ridiculous precision and even safely land at your chosen landing site without you ever having to lay a finger on the keyboard. Whether or not this powerful auto-piloting tool can be considered cheating is up to you, but if you’d rather not let your CPU have all the fun, you can manually pilot while still using MechJeb’s helpful auto-positioned maneuvering nodes, which simply inidicate when and where you should be firing your thrusters. That’s probably how real astronauts do it, after all. This satellite mapping tool lends some purpose to your expeditions by allowing you to create topographical maps of planets and moons. Attach the dish to a probe (be sure to add a solar panel, as the scanner creates a small electrical draw, and a battery to keep it ticking over in the dark) and launch it into orbit around your preferred rock. As long as you’re within 500,000km of the planet’s surface, you’ll start gathering raw data about the geography below. ISA MapSat will also highlight any objects detected on the surface, whether it be the smouldering debris of your failed attempts to land there, or something more ancient. Update: It seems ISA MapSat is no longer supported. Helpful commenter Mighty Gaz suggests looking to the very similar SCANsatmod instead. 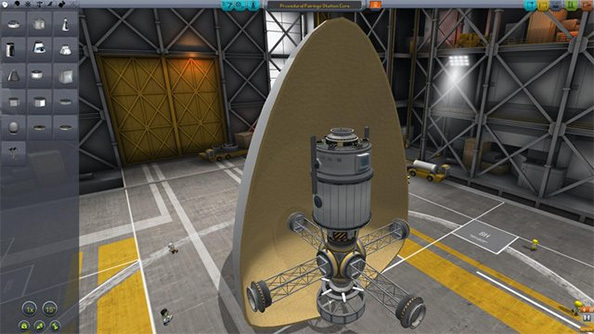 Kerbal Space Program’s aerodynamics aren’t, by default, all that punishing, which means you can launch rovers and complex objects into orbit on the tops of rockets without needing any sort of protective, streamlined casing. But, while naked machinery will survive the upwards journey, it’s certainly not a pretty sight. Make all of your rockets look like sleek dildos with the Procedural Fairing mod, which creates custom shielding on the fly to surround your rocket-mounted probes and other assorted crap you want to fire into space. As a bonus, the animation when the fairings break away to reveal your rocket’s hitherto shielded innards is spectacularly melodramatic. The enigmatically promoted Kethane Pack turns Kerbal Space Program from a sandbox into something resembling an actual game by randomly scattering deposits of valuable kethane all across the system. To find it you must first launch kethane prospecting, expeditionary probes to analyse the planet’s surface for seams, before embarking on ambitious mining projects, sending a ship fitted with the required tools to extract the precious, fictional gas. 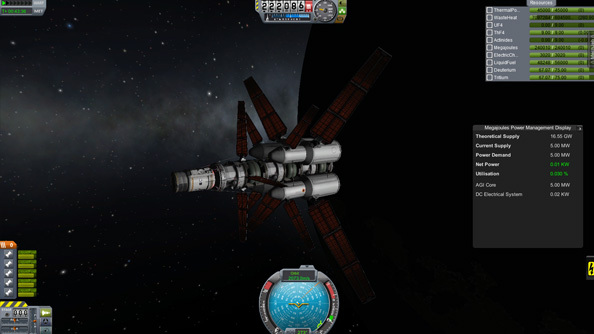 You can convert the stuff into fuel to supply distant refuelling stations and enable more convenient exploration of the farthest reaches of the Kerbol system. Seriously, watch the trailer. 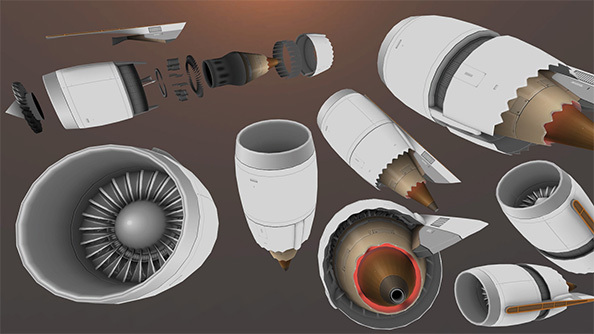 This extensive collection of new parts for Kerbal Space Program includes a selection of beautiful new cockpits with full interior modelling, a wide variety of new jet engines allowing for better spaceplane construction, parts that enable things like vertical take off and landing, as well as a host of pre-built example ships. Variable geometry wings and intakes mean you can tweak prefab parts to fit your ship designs with exact precision, which is ideal for players who’ve moved beyond simply trying to keep their craft intact and airborne and want to build something that looks like it’s just fallen out of Babylon 5’s prop designer’s handbag. Mods! Mooooods. 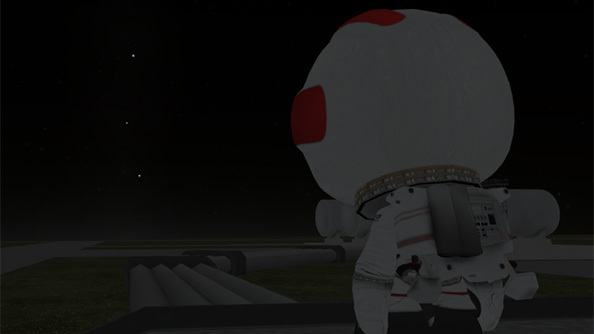 Find more of them at the Kerbal SpacePort or on the forum, yeah?